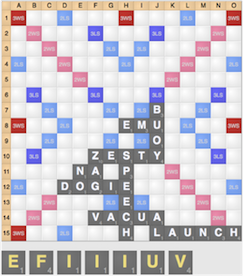 Everyone likes to think that they can intuit Scrabble strategy: after all, they view the challenge being with knowing and finding words, and in comparison, Scrabble strategy is easy, right? Well… unfortunately not. 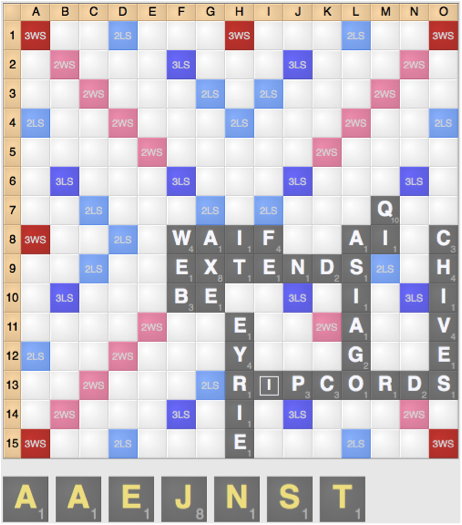 Here are the top 5 Scrabble mistakes that I see many players make. Mistake 1: They don’t think about their opponent’s response. Many players merely focus on creating as many possible openings as possible without thinking about what their opponent is going to do, and how their reaction is going to impact the board and their potential future options. In this case, your attempt to try to open a better bingo line allows your opponent to close the board and actually makes a bingo *less* likely because of your opponent’s response. 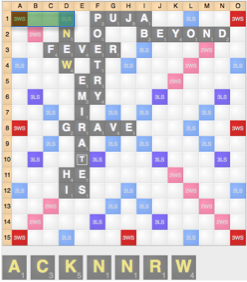 In this case you have a great setup, but it’s just too likely that your opponent is going to sacrifice points to block your setup, either by making a play to the N in row 2 or by hooking the A at 1d next turn. For that reason, you are better off just taking the points with KNEW or WONK instead. Many players play through their rack for minimal points and keep a bad leave, simply *hoping* that their rack is going to be playable next turn even though they are keeping a mediocre leave. 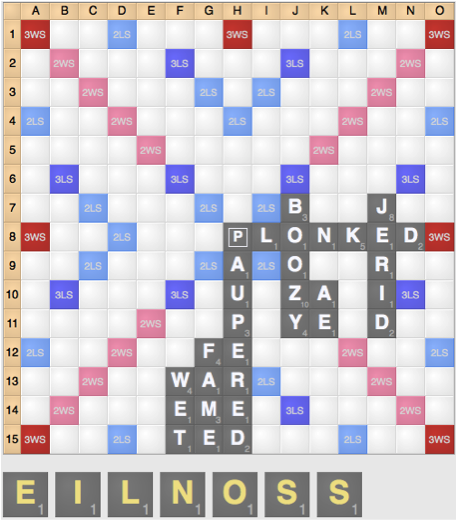 All too often, these wishes remain unfulfilled, and players remain saddled with a mediocre rack for several turns to come. Most of the time, you should just cut your losses and exchange instead of saddling yourself with a liability for future turns. Mistake 3: Fishing or trying too hard for a bingo, especially on really bad bingo boards. 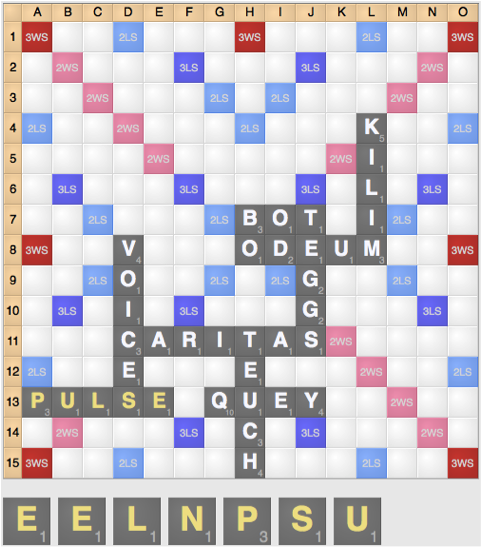 Many people are laser-focused on playing bingos, and will try with all their might to play a bingo, especially with strong bingo tiles, and often ignore the potential for playing a bingo given the current state of the board, resulting in fishing for a bingo that is likely to be unplayable next turn. 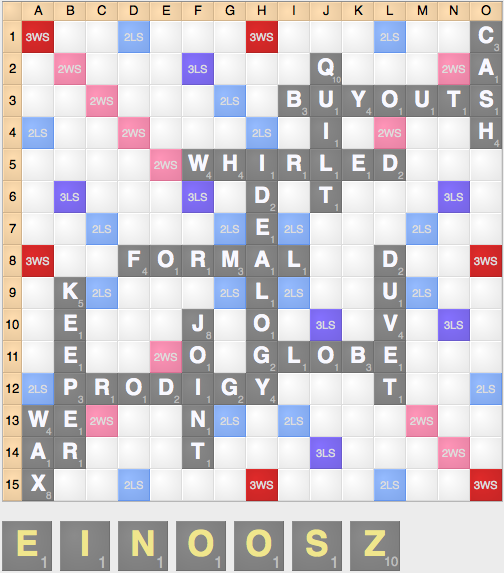 These players overestimate the value of a bingo and sacrifice way too many points and/or too much position in hopes of drawing that elusive bingo. Instead, you are usually better off taking a scoring option, such as JANTY 12d in the first diagram, and ENLISTED 15a in the second diagram. 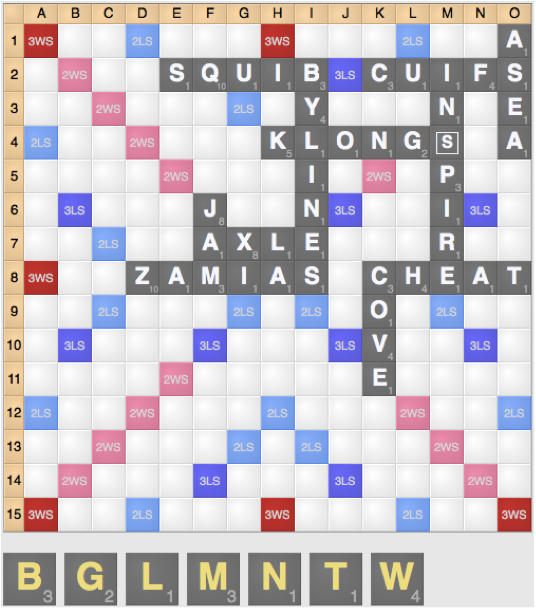 Many players view the value of the S only on one thing: the value of the S-hooks available on the board. 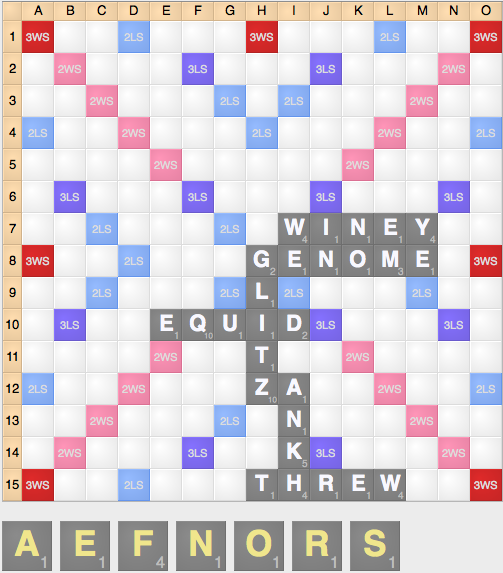 Without an S-hook, or a bingo, many players downgrade the S substantially: into a tile that has almost no value at all. 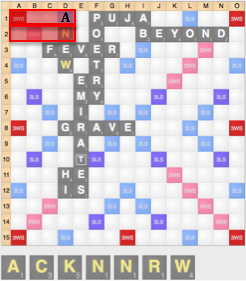 However, even on closed boards the S still has a ton of value: as a tile that can be used to make setups, use potential setups that your opponent might create, or just as a tile in a scoring play. Making plays like these plays illustrated above is just a waste of an S, which even despite the lack of lucrative S-hooks is still a strong tile to keep in your leave. 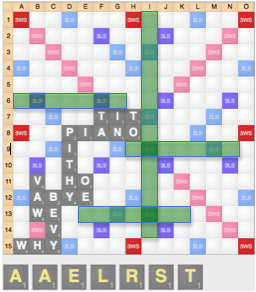 Many players’ eyes get fixated on the key spots on the board such that they neglect harder-to-see options because they see a play they like or a spot where they want to play. 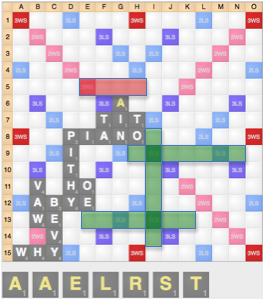 In the first diagram, most players’ eyes are glued on the E at e10 and the F spot at j6, such that they fail to see other options, even though there are two bingos available. In the second diagram, most people fixate on the S hook at 15f and the D at l8, and thus they miss plays such as ZOOKEEPER and ZOOID.